Jungle Red Writers: Do You Go For The Gold? Or for the Clicker? We just saw a very wonderful documentary about the Boys on the Boat, the 1936 Olympics. So great. Claire Booth--whose new book THE BRANSON BEAUTY is getting amazing reviews, and so well-deserved, has some thoughts. The Olympics start tomorrow. I can’t wait! I am a hopeless Olympic romantic. I’m in love with them. I love sports as it is, but the Olympics take my enjoyment to a whole new level. The competitions, the flags, the tears. The sappy athlete profiles from NBC. Yes, I’m not ashamed (too much) to admit that I love the vignettes that the Peacock Network subjects us to during their Olympics coverage. Sure they’re slick and overproduced, and sometimes overwrought, but they’re stories. 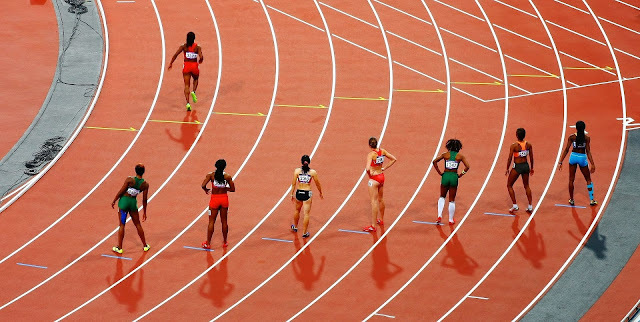 Little books in miniature, where the only thing missing is the ending – how will the determined athlete do? And so of course, you watch the event and you cheer even more than you would have, because now you’re invested. You’re kidding, she never even got in a pool until she was fifteen?! Oh my gosh, he’s come back from two broken feet to run in this race! Say what you want about NBC, they make you care whether you intend to or not. Which is not unlike, say, a novelist. Writers have to get you to care about the characters. They have to manipulate your emotions. If they’re really good, they make you laugh, or cry, or gasp in surprise. And they convince you to stick around for the finish. Sometimes, though, no matter what novelists come up with, reality beats us at our own game. 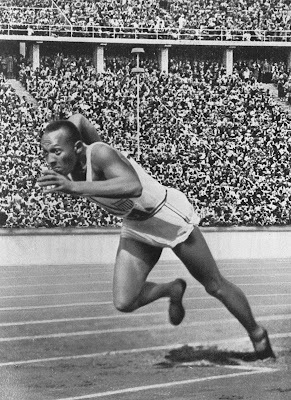 At the 1936 Olympics, an African American athlete named Jesse Owens won four track and field gold medals. In Berlin. In front of Adolf Hitler. In 1979, the Soviet Union invaded Afghanistan. 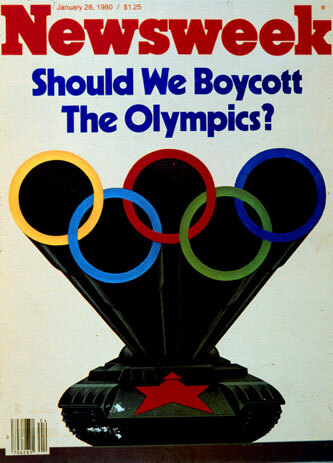 In response, President Carter decreed that the United States would boycott the 1980 Summer Olympics in Moscow. 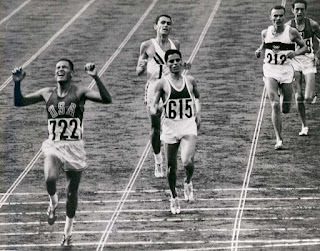 American athletes became pawns in the Cold War. There are many more instances, of course, where real world politics mixed with the sports of the Olympics. As a former journalist, I have to admit that I follow these stories particularly closely. This year, I’m really looking forward watching the refugee team, made up of athletes from South Sudan and other war-torn nations that don’t have Olympic squads, compete. There is always so much to learn about storytelling from real life, and there’s no better microcosm of the world today than the Olympics and its athletes. Reds, do you watch the Olympics? Which events are your favorites? And do you sit through the athlete profiles or prefer to go straight to the action? HANK: Summer Olympics? Gymnastics. (Nadia!) 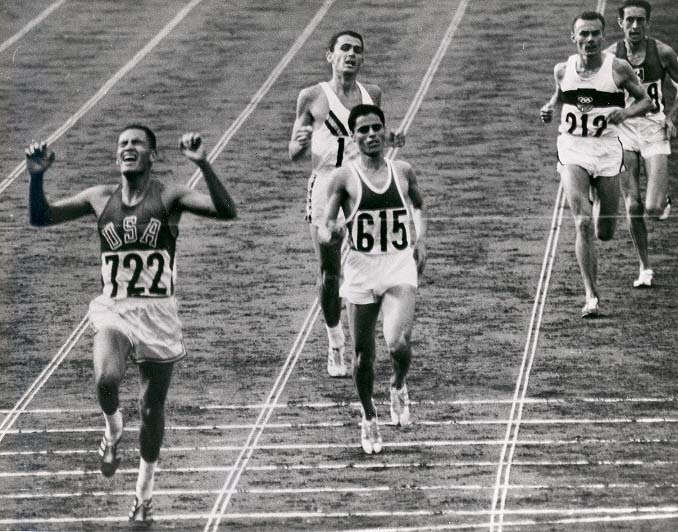 Track and field. Not so much beach volleyball. And I have a t-shirt, because I work for NBC, that’s the official NBC 1980 Olympic t-shirt. Except it turned out to be an event that they did not cover. And have you read Claire's THE BRANSON BEAUTY? It's a marvelous locked room--er, boat--mystery. I loved it! So much--that I'll give a copy to one lucky commenter! Claire Booth spent more than a decade as a daily newspaper reporter, much of it covering crimes so convoluted and strange they seemed more like fiction than reality. Eventually, she had enough of the real world and decided to write novels instead. Her Sheriff Hank Worth mystery series takes place in Branson, Missouri, where small-town Ozark politics and big-city country music tourism clash in, yes, strange and convoluted ways. Find her at www.clairebooth.com. The Branson Beauty, an old showboat, has inexplicably crashed on the waters of the Ozark mountain lake it’s been plying for decades. Hank Worth is still settling into his new job as county sheriff, and when he responds to the emergency call, he knows he’s in for a long winter’s day of ferrying more than one hundred passengers to shore. But he doesn’t expect to find the body of a high school track star locked inside the Captain’s private dining room. Now he must navigate small town politics as he tries to figure out who killed the talented local girl. Claire, “The Branson Beauty” sounds quite intriguing; I look forward to reading it. The Olympics? The whole doping/cheating thing is completely at odds with the spirit of the competition and when the officials look the other way, it really tarnishes their program. In the winter, we watch figure skating. In the summer, we watch gymnastics . . . we took the girls to Atlanta in 1996 and were fortunate enough to be there when the women gymnasts won gold. I like watching the Olympics but confess I probably won't do much of it this year except for the marathon and women's soccer. Gymnastics is pretty amazing, though! Claire, The Branson Beauty looks interesting. A new title and author for me. The Olympics. Yes, our family definitely watched both summer and winter Olympics. I especially remember a lot more when the Olympics were took place in Canada: 1976 (Montreal-summer), 1988 (Calgary-winter) and 2010 (Vancouver-winter). I watched more events in the winter Olympics over summer Olympics. Winter: Figure skating (all), men and women's downhill skiing, aerials, men and women's hockey, ski jumping. Claire, are you from Missouri? I grew up north of Kansas City and have been to Branson many times, long before it became an entertainment destination. Now my partner, Julie, has an urge to visit. Perhaps reading your new book will intrigue her further. Yes, I will watch the Olympics. The parade of nations always makes me hope some of the bonhomie will spill over into real life. I'm very afraid there will be an incident this year, lighting candles for the athletes. Have you been watching Michael Phelps this week? He was a kid with a difficult childhood, and now look what he's achieved. Most decorated athlete, Incroyable! I have a question for all the Reds and guests: Would you attend this year, given the opportunity? What with the world climate, not to mention the zita virus, I think I'd sit this one out. Hi Claire, adding your book to my pile--please tell us more about it when you stop in! Olympics, yes, and same as Hank, though I watch a lot of sports. It begins to feel like the 2 weeks are lost, doesn't it? We took the kids to the Atlanta Olympics--had to enter the lottery for tix and ended up with some very weird sports, including judo and weightlifting. We did see the women's basketball team win, so that was fun. And for the last two summer Olympics one of my daughter's college buddies was on the winning crew team--now that was a true tearjerker to watch! Joan wow--so cool! What a moment in time! Grace--there wee definitely some memorable moments in those--what am I forgetting? And I forgot about diving! What's so especially funny is how we all become big experts in all the jargon of the events! Ann? Let me just say--no way. And the woman channel 7 is sending is maybe 28. What a very tough decision I bet she had--a big time career making story--versus everything else. Crew! I'm so fascinated by it now. After that terrific documentary. Debs, you're a big expert because of your book, right! 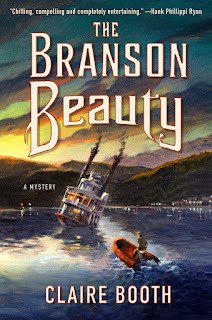 The Branson Beauty is on my TBR list for sure. Sounds like a wonderful book, and like Grace I must admit, new title and author to me. Olympics, not so much anymore. We did away with TV years ago when we realized we watched maybe 15 minutes a month. I will try to find YouTubes of the gymnastics and equestrian events though. Those are my favorite summer events. Winter ice skating for sure. Welcome to Jungle Reds , Claire! Happy to learn about Branson... great setting for a mystery. I am in awe of the athletes, and I love to read about them, and I used to watch the skating and gymnastics and diving, but I've been so turned off by the way the events have been televised in the past (camera in the face of a losers "how does it feel" and endless saccharine bios of the athletes) that even when I try to watch I end up turning it off. Has it improved? Maybe I should try again. Hank, I just saw an article this morning on the CBC (national broadcaster) website indicating only few Canadians were planning to watch the Rio Olympics. I should have also added women's soccer to my watch list for Rio since the Canadian team did medal in 2012 and have a good team this year. We definitely are a more winter olympics-focused country...we have a lot better chance to medalling in winter sports than summer sports! Canada finished first (for the first time) in the medal counts at the 2010 Vancouver Olympics...believe me, the country went wild that year! Having recently finished Megan Abbott's YOU WILL KNOW ME - centered around girls gymnastics, I will likely catch a few of those events this year. Because of that book, I'll be watching "differently" than I did before, but that is the beauty of literature. I worry about this year's Games. With all that is going on in the World and the poor state that Rio is in, I fear they might be making news for all the wrong reasons. Hopefully I am wrong and everything will come out without a hitch. Like Hallie, I do feel a bit manipulated with the whole "here is this athlete's story" thing. Everybody has a story and while one of the competitors might have overcome an injury, someone else might have lost a loved one (or something else not viewed as "dramatic" enough to entertain an audience). And don't even get me started on the asking the losers "how does it feel?" I get that it's television and needs to be engaging, but seeing someone suffer is never fun or easy. I love how most of us watch the gymnastics and figure skating! Same here, except due to Kiddo's love of all things horse, we'll be following all the equestrian events, too. Claire, the Branson Beauty looks intriguing! Kristopher, I just read YOU WILL KNOW ME, too. 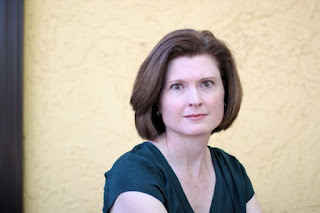 She's a slithery-creepy writer who wields adolescent girls like a weapon. That character, the girl gymnast, will stick with me. On Rio, reading about the sewage that's in the water the swimmers compete in? Ick. And for an athlete, usually you can't say "Oh, I'll take a pass and try again next time" - you're at your peak when you're at your peak. Will look for The Branson Beauty. I'm fascinated by showboats. There was one for years sitting at the Public Landing in Cincinnati; I used to park near it when I worked downtown, until the day the river rose up to the wheel wells of my little car! Nope, I would not go to the Olympics, and not just because of Zika. I'm not interested in being shoved around like cattle, or being with tens of thousands of other people. Crowds like that exhaust me. However, I will watch at least some of the Games. In the 70's I bought this great book called Rules of the Game, which details all the summer games and events, along with their rules. Many of the events are the same now, but a lot has changed since then. It's still interesting, though. And now of course we can check rules on Google instantly. Olympics watcher? Yes, but selective. Winter - hockey (men's and women's) and figure skating. My Boy was so upset with the gold medal game. One of his favorite players at the time was Sidney Crosby (on the Canadian team), but he's American and he loved Ryan Miller (USA goalie). But as a hockey fan, I can say it was an amazing game. Pretty sure that was 2010 in Vancouver, but I might be wrong. Don't quote me. What hockey fan can forget the Miracle on Ice of 1980? 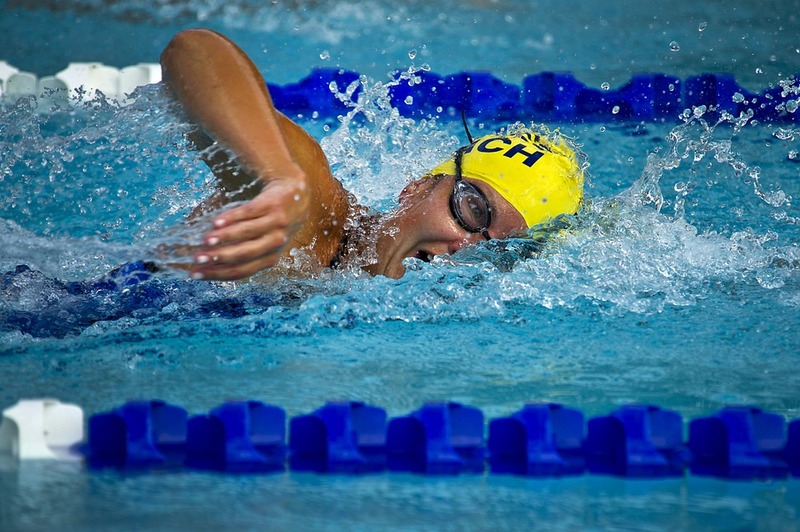 Summer- gymnastics and swimming. The Girl's high school has two alumni in the Olympics this summer. Leah Smith ('13) for swimming and Amanda Polk ('04) in rowing. So I'm sure the school will be posting LOTS of updates. Michael Phelps at his peak? Awesome. Yeah, the doping scandal is quite a bummer, but I always knew Russia was sneaky that way. I do worry about security and health/safety conditions in Rio. Here's hoping it goes smoothly. 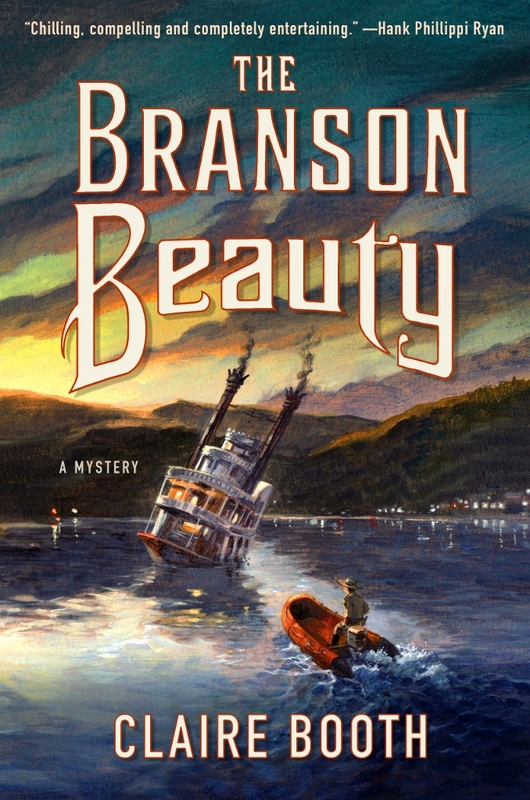 The Branson Beauty looks intriguing. Claire, your book sounds like a gold-medal contender--will be looking for it--love the title--and your sheriff sounds like someone I want to get to know! As for the Rio Olympics--what a hot mess--no, would not go even if someone gave me tickets--like Karen, don't care for crowds--and I've been reading some of the lead-up stories--the Olympics promise a great deal to the neighborhoods they demolish--but a survey of post-Olympic venues tells a different story! Add in Zika and the rest--I sure hope the athletes are safe. Hello, everyone! First, Joan, wow! That is amazing you were there for the gymnastics gold in '96! I have a feeling they'll take gold again this year. It's great that everyone has favorite sports they'll watch. And I don't blame you, Grace, for being more focused on the winter sports. It's certainly an area where Canada excels! Ann in Rochester, I'm not originally from Missouri. I guess you could say I married into Branson! I went to the University of Missouri for journalism and that's where I met my husband. He was born and raised in Branson. It is such a fascinating town! It's a small town, but it gets more than six million visitors a year, so it has to have a huge infrastructure to deal with all that. Throw in small town politics and the fact that everybody knows everybody else, and the dramatic possibilities are endless. If you and Julie decide to go, let me know and I'll give you some tips! Oh, Hank, I can't imagine what that poor 28-year-old reporter went through in deciding whether to go to Rio. Such a difficult decision. I hope that she - and everyone else - comes out healthy. It is just horrible that Zika has exploded like it has - for Brazilians and foreigners alike. Hi Claire! I'll look out for your book. I don't know Branson, but I love Eureka Springs, Arkansas, which I imagine is not all that different in looks and character. And, Hank, yes, I watch winter and summer. Favorites are gymnastics (daughter was a gymnast) and ice skating, but since No Mark Upon Her I watch rowing feverishly. I have the book Boys in the Boat but didn't know they'd made a documentary so am looking for that right away. Where did you watch it? I would love to have seen the crew events in London, but even my friend who works at Leander Club couldn't get tickets. I watch almost all the winter sports. In summer, not so crazy about the team events. And I am very non-sporty, generally. No football watching at all, although I do like baseball. Would I go? No, absolutely not. Even if it weren't for Zika and the state of the world, I'm with Karen on the big crowds. Growing up my family watched the Olympics with regularity. Since I've grown up (or whatever this is that comes with additional age), I fallen off. First, there was the never ending annoyance at how judging was done. It all seemed much too political with little to do with skill (especially skating). Now that the truth has come out about how the Olympic committee demands to be treated (like royalty), how terribly the locals are treated (dispossessed without a dime), and how many promises (We will clean up that dreadful open sewage pouring through your area. After all, it flows into the water where the water events like sailing occur. Well, no we won't. ), I refuse to watch. Mary, I agree, the doping scandal is a bummer, but not surprising it's Russia. And I love your new profile pic! Debs, Eureka Springs is beautiful, isn't it? I think the traffic might be worse in Branson ... especially when the shows are all getting out! Oh, The Branson Beauty is high on my wish list. Living on the Ohio River my whole life, I'm familiar with riverboats such as The Belle of Louisville and The Belle of Cincinnati. There's an eleven-day Ohio River cruise from St. Louis to Pittsburgh that stops along the way in my hometown of Maysville, KY, where I'm headed this weekend with my daughter and granddaughters. I remember being on a couple of riverboats when I was growing up and finding them fascinating. As for the Olympics, I never intend to watch them as much as I end up doing. I do enjoy the vignettes for the athletes, which is one of the reasons I end up watching more than I intend. As you say, Claire, we get invested in the athletes and rooting for them. I do worry for all the athletes this summer with the location of Rio. I've read much about the horrible state of the water, in which some athletes will have to place themselves, and the Zika virus. I wouldn't want to be there. A book set in Branson? I'm on it. I've been one time and it has been many years. It still seems strange that all these theaters and clubs landed in Branson. And all that traffic. . . I run hot and cold on the Olympics. I don't know if I'll watch any of it this summer. If I do it would be women's soccer and gymnastics. I'm a sucker for the ice skating in the winter olympics. Torville and Dean. Yes! I even bought figure skates when we lived in Minnesota and took lessons. I never could figure out how to go backwards. I'm afraid I haven't skated since. Debs,it was on PBS, so should be easy to find. And you know, I've never been to Branson--Pat D, Claire, what's the scoop? Libby Dodd, agreed! It is breathtakingly scandalous. And yes, those profiles. It's crazy isn't it? The producers believe that people have to be ENTERTAINED at every moment, and that entertainment means pounding you over the head with emotion and stakes. I mean yeesh. Remember when Up Close and Personal was a new concept? I usually pay more attention to the winter Olympics -- I like the sports of them better. However, I did watch the opening and closing ceremonies of the last summer ones in London. Fan-freakin'-tastic. Danny Boyle, the mastermind behind them, did a phenomenal job. The Branson Beauty sounds great! Best of luck with it, Claire. Olympics: always watch opening ceremony, but after that, I'm only interested in swimming. My sons were swimming so it's a family event. This year, though, I have to watch women's basketball because Elena Delle Donne from Delaware is on the team. She's an extraordinarily talented and giving young woman who has done so much for Special Olympics in honor of her sister, who is severely disabled. Go, Elena! Pat D, what was your favorite part of your trip to Branson? Mine, I say with no shame and a full tummy, is The Fudge Shop, which has been in downtown Branson for almost 50 years. All homemade and to die for! And the whole place is surrounded by absolutely stunning forests and mountains and cliffs and lakes.